Panama Jack's Island Breeze set incorporates a tubular aluminum frame in a unique powder coated espresso finish that will not rust. 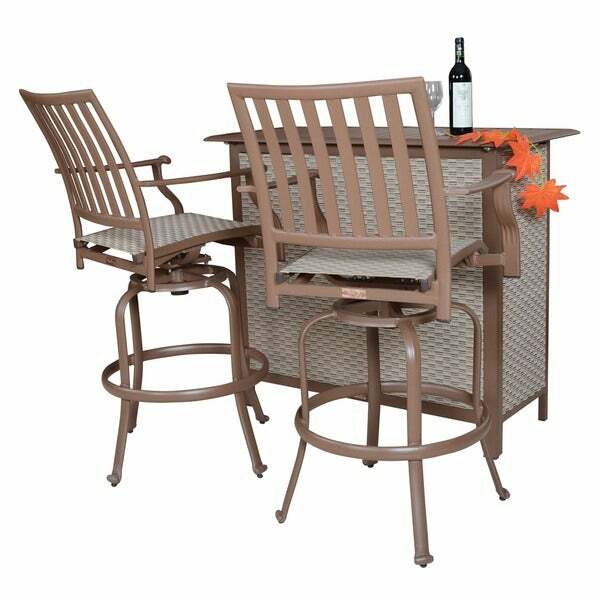 This versatile bar set is weather proof and long lasting so you can enjoy company and relax for years to come. Please note: Orders will be shipped via Freight carrier and our Oversized Item Delivery/Return policy will apply. Please click here for more information. "What does the bar look like from behind? Is there storage or shelves on the inside back? Can you post a picture of the back?" Hello rowlettr, thank you for your inquiry. Unfortunately, the information you have requested is currently unavailable. You will receive an email notification once an answer is posted. Have a great day.